To the degree that we identify with a bright and blameless persona, our shadow is correspondingly dark. The persona aims at perfection. The shadow reminds us we are human. Everything about ourselves that we are not conscious of is shadow. Psychologically, the shadow opposes and compensates the persona, the “I” we show to the outside world. Where we are concerned to put on a good front, to do what is considered by others to be proper, our shadow is not. The realisation of how and when our shadow enters our life, and at times takes over, is a precondition for self-knowledge. The more we become conscious of our shadow’s intentions and behaviour, the less of a threat it is and the more psychologically substantial we become. In Jung’s description, the shadow, or at least its dark side, is composed of morally inferior wishes and motives, childish fantasies and resentments, etc.—all those things about ourselves we are not proud of and regularly seek to hide from others. For instance, in civilised societies aggression is a prominent aspect of the shadow, simply because it is not socially acceptable; it is nipped in the bud in childhood and its expression in adult life is met with heavy sanctions. The same is true of sexual behaviour that deviates from the collective norm. By and large, then, the shadow is a jumble of repressed desires and “uncivilised” impulses. It is possible to become conscious of these, but in the meantime they are projected onto others. Just as we may mistake a real man or woman for the soul-mate we yearn for, so we see our devils, our shadow, in others. This is responsible for much acrimony in personal relationships. On a collective level it gives rise to political polarisation, wars and the ubiquitous practice of scapegoating. 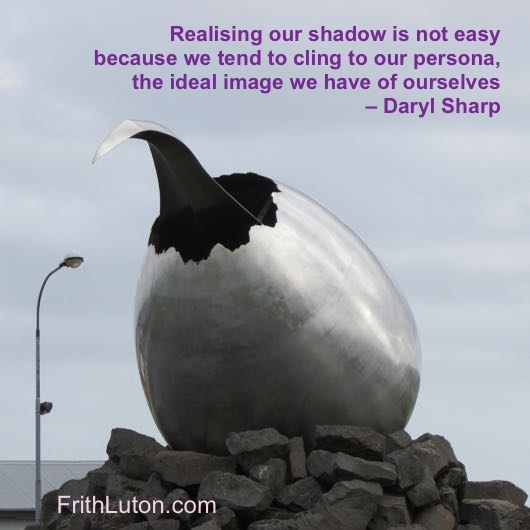 Realising our shadow is not easy because we tend to cling to our persona, the ideal image we have of ourselves, which in a culture based on Judeo-Christian values is heavily influenced by the “Thou-shalt-nots” enshrined in the Ten Commandments. In everyday life, we do many things under the influence of a shadow fed up with the persona. We cheat on our tax returns; we lie, steal, and sleep with our neighbour’s wife. When called to account, we are shamefaced and wonder who did it. There is no generally effective way to assimilate the shadow. It is more like diplomacy or statesmanship, and it is always an individual matter. Shadow and ego are like two political parties jockeying for power. If one can speak of a technique at all, it consists solely in an attitude. First, one has to accept and take seriously the existence of the shadow. You do this by taking note of how others react to you and you to them. Second, one has to become aware of the shadow’s qualities and intentions. You discover this through conscientious attention to moods, fantasies and impulses. (Best to write them down, for future reference.) Third, a lengthy process of negotiation between you-as-you’d-like-to-be and you-as-you’d-rather-not-be is unavoidable. On the other hand, the shadow is not only the dark underside of the conscious personality. It also has a bright side: aspects of ourselves that comprise our unlived life—talents and abilities that have long been buried or never been conscious; part and parcel of who we are meant to be. They are potentially available, and their conscious realisation often releases a surprising amount of energy. That is why, in Jungian analysis, a depressed or fearful person is counselled to go into their fear or depression rather than try to escape it. “Going into” a mood means confronting it. Don’t identify with it; rather, give it a name and dialogue with it. The buried treasure in our moods can only be unearthed by conscious effort. Could it endanger my life? How might it affect my loved ones? Could I live with the consequences? A psychological crisis activates both sides of the shadow: those qualities and activities we are not proud of, and possibilities we never knew or have forgotten were there. Associated with the former—according to consciously-held moral values—is a sense of shame and distaste. The latter may have morally neutral connotations, but they are often more frightening because if we follow up on our latent possibilities there is no telling what might happen. In practice, ego and shadow can either collaborate or tear each other apart. This is a powerful and widespread archetypal motif. It is found in the Biblical stories of Cain and Abel, Isaac and Ishmael, Jacob and Esau; in Egyptian mythology there is Horus and Set; in Christianity, Yahweh and Satan, Christ and Judas. In Freudian terminology it is known as sibling rivalry. In Jungian psychology it is called the hostile brothers motif. Gilgamesh was a young Sumerian ruler, half man and half god, who after many heroic exploits became proud and arrogant. Seeing Gilgamesh’s tyranny over his subjects, the gods sent down a brother, Enkidu, to teach him a lesson. Enkidu was an animal-man. His whole body was covered with hair. At first he roamed wild on the plains, living close to nature. He was all animal until a woman dragged him into the bush and tore off his pelt. Then he became half man, familiar with lust, and ravaged the countryside. Gilgamesh was angered by news of Enkidu and challenged him to do battle. Enkidu accepted and they tangled at the temple gates. It was a long and nasty struggle. They fought tooth and nail, but in the end it was a stand-off. They then embraced and toasted each other as best friends. Together, Gilgamesh and Enkidu were half man, a quarter god and a quarter animal. For years thereafter they traveled the world righting wrongs, defeating awesome monsters like Humbaba, guardian of the cedar forest, and the bull of heaven, a fearsome beast created by the gods to destroy Gilgamesh because he refused the advances of the goddess Ishtar. Then Enkidu became sick and died. That was the decree of the gods, to placate Ishtar for Gilgamesh’s rejection of her. Gilgamesh was bereft. He set out on a quest for the elixir of life. After a long journey he finally found it in the shape of a thorny plant at the bottom of the sea. Joyfully he set off for home. But one day, as he was taking a cold bath in a clear pond, a snake crept into his camp and ate the plant. Gilgamesh gnashed his teeth and wept bitterly. He had had the elixir of life in hand and he lost it! He died a broken man. Thus, according to the legend, snakes gained the power to shed their old skin and thereby renew their life. We humans still have to do it the hard way.